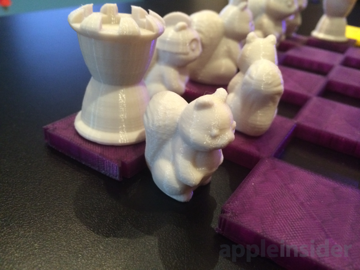 As the technology behind 3D printing improves, market leader MakerBot continues to expand its lineup of devices, and is working to enhance its connectivity with Apple's iOS ecosystem. 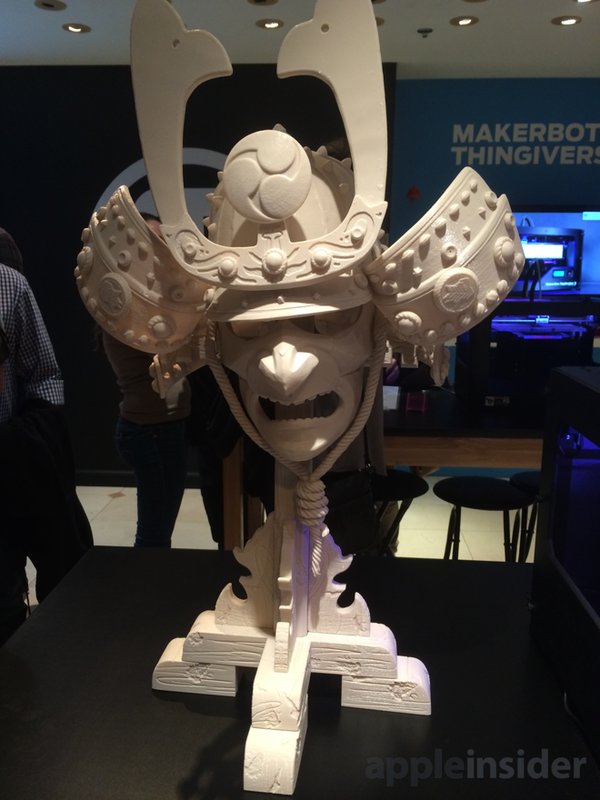 MakerBot Industries held an event at one of its new retail locations in Boston late last week to show off its fifth-generation of 3D printers, the company's new Digitizer desktop 3D scanner, and to offer a sneak peek at KeyShot 5, the latest generation of the 3D rendering and animation application available for Mac as well as Windows PCs. 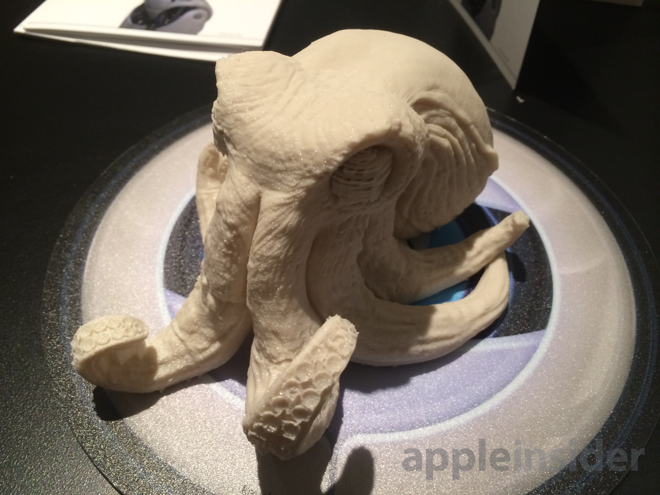 AppleInsider was in attendance and had a chance to see the new products. 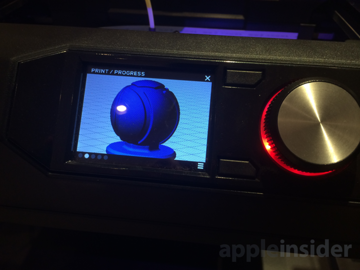 The 3D printers and scanner from MakerBot can be controlled with software via the Mac, while new iOS-specific applications are also coming soon from the company. 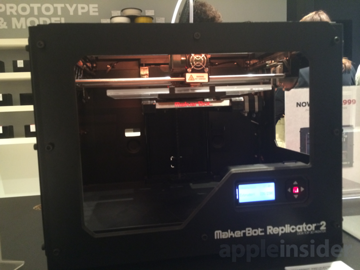 MakerBot Mobile for iPhone will give users the ability to monitor and control the new fifth-generation printer, while MakerBot PrintShop on iPad will let users create and 3D print objects. 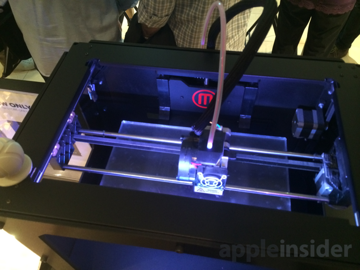 The new $2,899 fifth-generation MakerBot Replicator includes the new user-friendly 3D printing platform that is app and cloud enabled, while USB and Ethernet connectivity are set to be joined by Wi-Fi support in the near future. The hardware includes an onboard camera and diagnostics with assisted built plate leveling, along with a new Smart Extruder, motion controllers and gantry designs. It has an 11 percent larger build volume and faster print times than its fourth-generation predecessor. MakerBot's other fifth-generation 3D printers are the Replicator Mini and the Replicator Z18 ($6,499) and the Replicator Mini ($1,375). 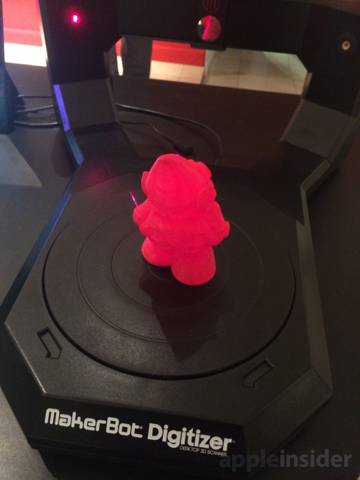 At the company's event, MakerBot was showcasing KeyShot 5 and its ability to create renders for its 3D printers. 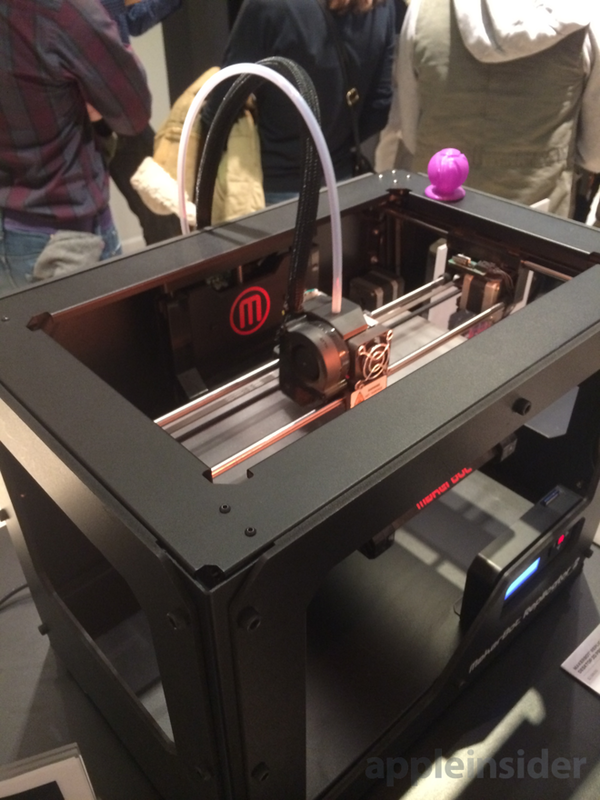 Different models of MakerBot printers were also set up, churning out little plastic trinkets for attendees to play with. Most of the printers were creating a hollow ball with a stand on the bottom. Creation of this item took about 30 minutes, making it a simple demonstration of the MakerBot printers and what they can do. But plenty of other, larger items were on hand, including a full-size Japanese kabuto, a chess set featuring squirrels, a pink guitar, an extremely detailed octopus, and small-scale versions of buildings. Some of these items were too big for one printer to create, even the company's largest model. 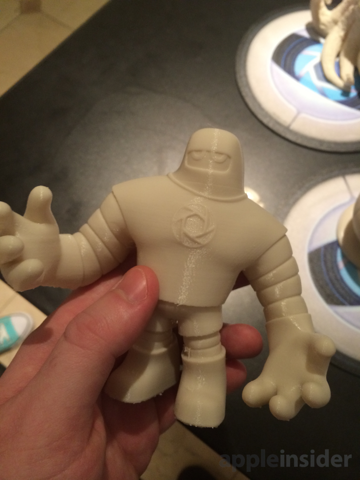 So they are printed in parts, which can be combined to create the final product. For example, the aforementioned guitar came in three parts, one of which was a thicker and heavierplastic build. We were told that the whole thing took 17 hours to build. 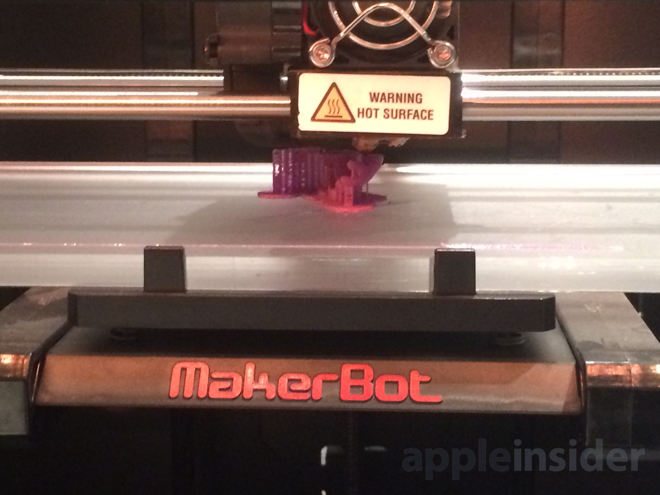 In addition to its upcoming, full-featured iOS applications, MakerBot Industries currently offers its Thingiverse app, which allows mobile users to browse 3D printer files available on the Thingiverse website. 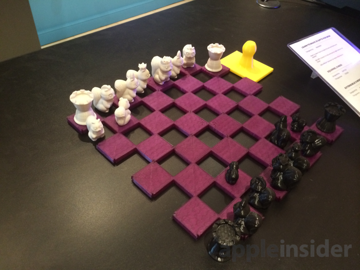 Using the iPhone app, users can browse, review and even upload pictures of printed objects to MakerBot's online community. 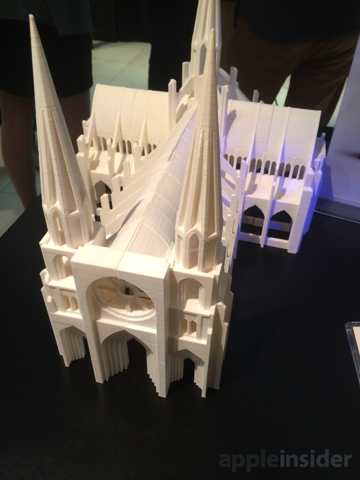 As for the new $799 Digitizer, it takes about 10 minutes to scan in a three-dimensional object, with a maximum size of 8 by 8 inches, to create a render for one of the company's 3D printers. The system utilizes a turntable-style platter to rotate an object while it's scanned by lasers. It's intended to make it easy for any person to scan in an object and use a 3D printer, without the need for advanced software. As for MakerBot's new retail store, in addition to its Digitizer and 3D printers, the company also sells plastic filament spools for printing new objects, and even small trinkets for those who may not want to spend a thousand-dollars-plus on a printer or scanner. Items available at the Boston location include a tiny recreation of Fenway Park, a rendition of the park's fabled left-field "Green Monster," and an iPhone dock that angles the handset's speaker forward to amplify it for listening to audio. The MakerBot store also offers 3D printing services, for those who might need a one-time replication and aren't in need of owning their own printer. 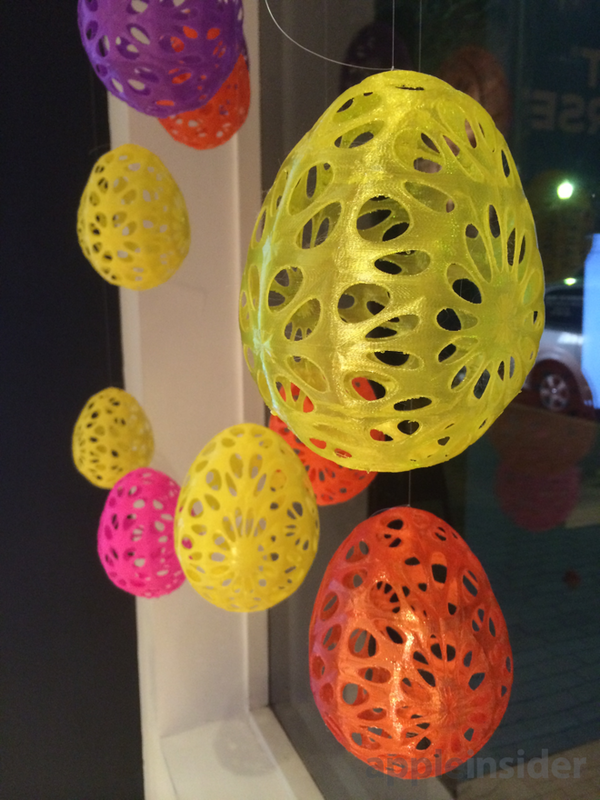 With Easter coming up, the storefront windows were adorned with multi-colored 3D-printed decorative eggs, and one window even featured a printer hanging from the roof, printing out objects for passersby to see in progress. In addition, the company's fourth-generation MakerBot Replicator 2 and MakerBot Replicator 2X Experimental are still available to purchase at discounted prices.